A university excursion to Hong Kong was the beginning of the transformation of Jeff Olson, troublemaker, into Lama Lodro, respected monk. When he found himself in the Orient, Olson remembered how, as a child, he had been fascinated by a black and white travelogue depicting the exotic temples and long haired yogis of India. “I was seven years old, and I knew immediately I wanted to be like them.” He split off from the group and began a two year pilgrimage on foot to ancient spiritual sites in China, Laos, Cambodia, Malaysia, and Sikkim. Terrifically impressed by a Buddhist teacher he encountered in Thailand – “This man radiated compassion and kindness, people lined up every morning just to sit in his presence” – Olson took the traditional vows of a monk, and formally began his spiritual journey. “From the moment the fertilized cell begins dividing, we start building our neurotic conditioning,” says Lama Lodro, “The process of liberation requires a concentrated effort to untangle the accumulated negativity of many lifetimes.” For some, this untangling of past and current Karma is a gentle, slow unfolding. And under the tutelage of several different meditation masters all over Asia, Olson did experience some sublime states. But these were interspersed with periods of fearful intensity. “For one two-year period, my body felt like a bag of broken glass that was constantly being agitated by electrical discharges,” Olson recounted. “During another extended session everything, including my own body, seemed to be on fire.” Olson spent so much time in the traditional cross-legged posture that his knees swelled and locked up, preventing him from walking for a number of months. One of his Asian teachers told him that he would eventually find his ultimate teacher in Canada. 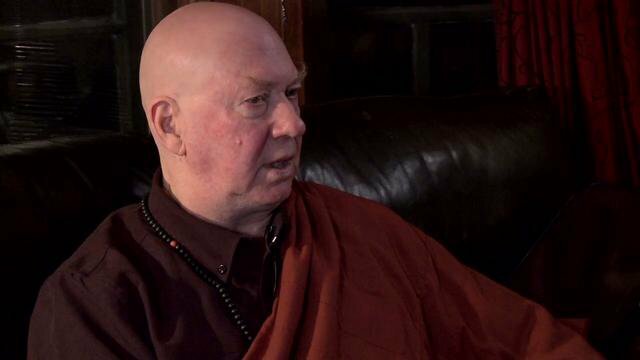 So Olson left the East, and after meeting the Venerable Namgyal Rinpoche (one of the first Westerners to be recognized by Tibetan Buddhist leaders as a fully awakened being) became a Canadian citizen. He continued his studies with Rinpoche – Rinpoche is a Tibetan honorific meaning ‘Precious One’ – and eventually insight, peace, and physical health returned. Today Lama Lodro is an eloquent speaker and an engaging teacher in his own right. He tells many fascinating, sometimes funny stories about his time in Asia and about his meditational experiences. Presently he is working on his first book, a meditation manual for Westerners.